Portlet creation using the Plugins SDK is simple. There’s a portlets folder inside the Plugins SDK folder, where your portlet projects reside. The first thing to do is give your portlet a project name (without spaces) and a display name (which can have spaces). 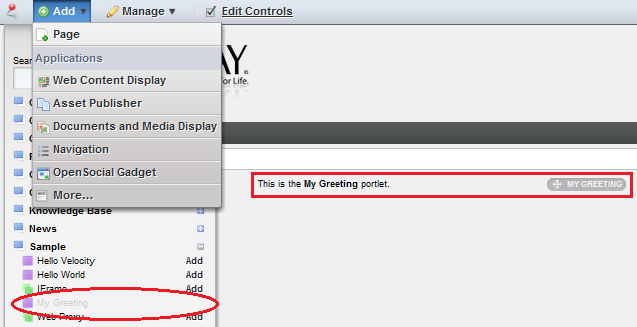 For the greeting portlet, the project name is my-greeting, and the portlet title is My Greeting. Once you’ve named your portlet, you’re ready to begin creating the project. There are several different ways to create this portlet. Let’s try it using Liferay Developer Studio first, then by using the terminal. Go to File → New → Liferay Project. Fill in the Project name and Display name with my-greeting-portlet and My Greeting, respectively. Leave the Use default location checkbox checked. By default, the default location is set to your current workspace. If you’d like to change where your plugin project is saved in your file system, uncheck the box and specify your alternate location. 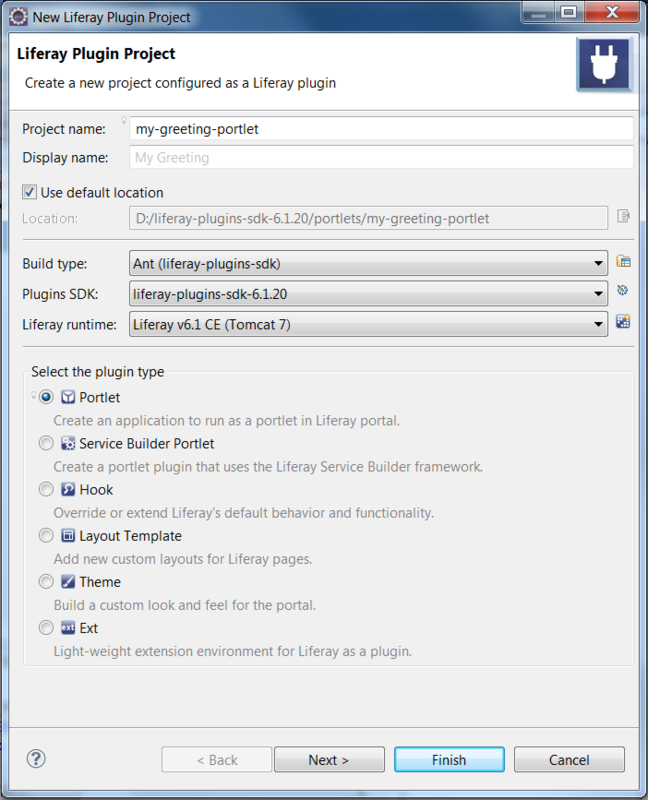 Figure 3.1: Creating portlet projects with Liferay IDE is easy. Select the Ant (liferay-plugins-sdk) option for your build type. If you’d like to use Maven for your build type, navigate to the Using Liferay IDE with Maven section for details. Your configured SDK and Liferay Runtime should already be selected. If you haven’t yet pointed Liferay IDE to a Plugins SDK, click Configure SDKs to open the Installed Plugin SDKs management wizard. You can also access the New Server Runtime Environment wizard if you need to set up your runtime server; just click the New Liferay Runtime button next to the Liferay Portal Runtime dropdown menu. Select Portlet as your Plugin type. In the next window, make sure that the Liferay MVC framework is selected and click Finish. With Developer Studio, you can create a new plugin project or if you already have a project, create a new plugin in an existing project. A single Liferay project can contain multiple plugins. You should get a BUILD SUCCESSFUL message from Ant, and there will now be a new folder inside of the portlets folder in your Plugins SDK. This folder is your new portlet project. This is where you will be implementing your own functionality. Notice that the Plugins SDK automatically appends “-portlet” to the project name when creating this folder. Alternatively, if you will not be using the Plugins SDK to house your portlet projects, you can copy your newly created portlet project into your IDE of choice and work with it there. If you do this, you will need to make sure the project references some .jar files from your Liferay installation, or you may get compile errors. Since the Ant scripts in the Plugins SDK do this for you automatically, you don’t get these errors when working with the Plugins SDK. To resolve the dependencies for portlet projects, see the classpath entries in the build-common.xml file in the Plugins SDK project. You can determine from the plugin.classpath and portal.classpath entries, which .jar files are necessary to build your newly created portlet project. This is not a recommended configuration, and we encourage you to keep your projects in the Plugins SDK. Tip: If you are using a source control system such as Subversion, CVS, Mercurial, Git, etc., this might be a good moment to do an initial check-in of your changes. After building the plugin for deployment, several additional files will be generated that should not be handled by the source control system. Liferay provides a mechanism called auto-deploy that makes deploying portlets (and any other plugin types) a breeze. All you need to do is drop the plugin’s WAR file into the deploy directory, and the portal makes the necessary changes specific to Liferay and then deploys the plugin to the application server. This is a method of deployment used throughout this guide. If at any time you need to redeploy your portlet while in Developer Studio, right-click your portlet located underneath your server and select Redeploy. A BUILD SUCCESSFUL message indicates your portlet is now being deployed. If you switch to the terminal window running Liferay, within a few seconds you should see the message 1 portlet for my-greeting-portlet is available for use. If not, double-check your configuration. In your web browser, log in to the portal as explained earlier. Hover over Add at the top of the page and click on More. Select the Sample category, and then click Add next to My Greeting. Your portlet appears in the page below. Congratulations, you’ve just created your first portlet!